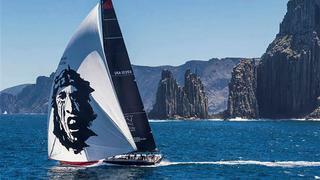 Sailing superyacht Comanche is a boat that belongs at the front of the racing pack. 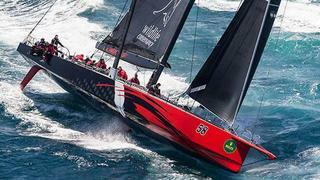 Comanche _surprised everyone watching the Sydney Hobart race in December 2014 when the brand new 30.5 metre Hodgdon Yachts-built speed machine was pictured tearing along ahead of Sydney Hobart legend Wild Oats XI. 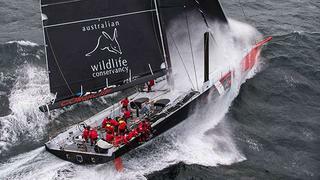 It was an advantage that _Comanche was able to maintain all the way to the Bass Strait during the 2014 Rolex Sydney Hobart. But when 30-knot winds failed to materialise, the more slender Wild Oats XI slipped past Comanche and into the lead, a position she held all the way to Hobart for victory and her eighth line honours. 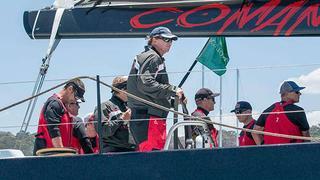 Second place is never going to be good enough for Comanche’s owner, software mogul Jim Clark, but it was a minor miracle his yacht was there at all. She was only launched in September 2014, so the famously brutal race represented a kind of masochistic shakedown for a yacht designed for just one thing – to win. 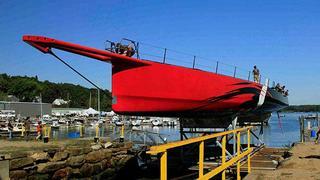 Think Laser dinghy or 49er morphed with rocket ship and you’ll get some idea of the qualities of_ Comanche. At the yard, the racer was partially hidden behind two larger yachts with immaculate pedigrees, _Meteor and Artemis, but Comanche’s square bow and carbon sprit jutted out beyond them, drawing the eye away from the varnished teak of her neighbours to a lean sailing machine intended to go as fast as possible powered only by the wind. Sailing legend Ken Read, who also happens to be the president of North Sails, managed the project from day one for Jim Clark. Built at Hodgdon Yachts in Maine, US, Comanche had a hand-picked design and engineering team of international experts. 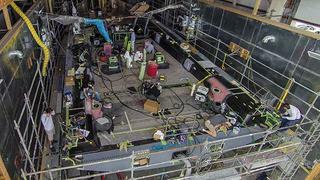 It also had a construction schedule that raised eyebrows from the first day Jim Clark talked to Boat International about the radical project during the America’s Cup Superyacht Regatta in San Francisco, September 2013. Comanche launched one year later and after stepping the mast in Newport, Rhode Island, and just two weeks of sailing trials, including a 600-mile qualifying sail to Charleston, South Carolina, the boat was packed aboard a cargo ship and sent to Australia to compete in the Sydney Hobart, which starts each year on Boxing Day. 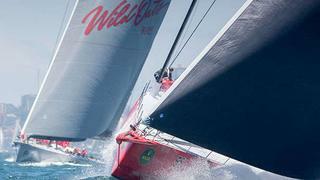 Jim Clark and his Australian wife, Kristy Hinze-Clark, met the boat in Sydney for its short re-commissioning, Hinze-Clark racing aboard Comanche in a harbour tune-up event on 9 December 2014, where the yacht placed second despite poor conditions. The tabloids had a field-day, captioning photos with, “The supermodel and the supermaxi” and “She’s got legs” in reference to Kristy Hinze-Clark’s modelling career. These days she is a businesswoman, director for the Australian Nature Conservancy and the mother of two girls. When Jim Clark decided on a supermaxi, his plan was to go for line honours rather than wins on corrected time, and speed/distance records that could be set for yachts with human powered winches. “I don’t want any of that record stuff with an asterisk that says push-button winches,” Jim Clark scoffs. With this target, Jim Clark and Ken Read embarked on a “design experiment” for a yacht that could sail 30 knots or more on a broad reach. The experiment pushed them to some extreme stats, which Jim Clark says were run through CFD tests and simulations time and again. “The 25-foot (7.6 metre) beam saves weight,” Ken Read says. “By going wider, we can have less weight in the keel to keep the same righting moment, thus we will go faster.” This thinking is carried over into the keel itself, which is solid stainless steel and not welded. With a 6.7 metre draught, the keel can be two tonnes lighter than a comparable keel on a boat with half the draught. The governing factor was the depth of Rhode Island’s Newport harbour where the boat will be based when not chasing records. “With the keel canted to one side we can just get to our berth,” Read says. Hodgdon, the oldest boatbuilding business in the US, might seem like an odd choice if you don’t know that part of the yard’s annual output is high-tech military vessels and another part is carbon fibre limo tenders. In fact, Hodgdon is quite skilled at innovative construction techniques and when Tim Hodgdon agreed to build an oven to cook Comanche’s carbon fibre hull, the deal was struck. The yard’s location also made it a good gathering stop for its far-flung team. Is_ Comanche_ too powerful to handle? Some critics have said Comanche is too extreme and too powerful to handle, but Jim Clark just laughs at this and suggests we “ask Kenny”. “Yeah, it’s still an unknown but I’m not overly concerned,” he adds. “The hull is well baked and it’s been ultrasounded and X-rayed. There is a fuse in some of the loads so that nothing super bad can happen. But you can’t have a fuse in the rigging… Some of those termination points on the rig are kind of scary,” Jim Clark says. That rig, which rises 47 metres above the waterline, is more than 50 per cent of the length aft from the bow, a surprising configuration but based on model testing for best all-around performance with the foil and appendages. Also innovative on _Comanche _are the daggerboards outboard of the mast and slightly forward of it. By canting the keel and putting the lee side daggerboard fully down, the boat generates enough lift to keep the angle of leeway to a minimum or crab up to a mark. Comanche‘s wide cockpit, full of grinder pedestals, hydraulic sail controls and sophisticated LED panels, gives the impression of a workhouse with modern instruments of torture. In a way, that is what they are. Grinders will work these six pedestals to turn the Harken winches. The only push-button winch on board is used to raise the mainsail. Once that sail is up the halyard is locked off and the winch isn’t used. The winch pedestals are set slightly inboard and Read explains that when sailing on other 30 metre yachts he found that waves coming inboard at 30 knots or so would sweep the helmsman or winch grinders off their feet. “I have fetched up in the corner of the cockpit with pieces of steering wheel in my hands,” he says. Thus, by having 10 feet more beam than other 30 metre boats, there is space to put people and gear in a safer location with the added benefit of space for sails to be temporarily stored outboard of the pedestals on the high side. Another interesting option is set right into the deck. Small black plugs cover screw holes that allow a dodger to cover both hatches. “On long distance races, we wanted the option to erect a dodger to keep the crew safe when on deck,” Read says. A slot in the cockpit sole just aft of the dodger allows the steering wheel to be moved forward, allowing the helmsman to stand behind the dodger for more protection. Step below and you can see how much weight has been saved on Comanche. The single-skin carbon fibre hull and foam cored framing is fully exposed. It is mostly black with white non-skid patches. The forward end of the vessel is totally open, to store sails. Directly under the cockpit on either side are the crew berths, which keep the crew centre of gravity aft, close to the position they would be in when on deck; thus the trim of the yacht is not affected by off-watch crew moving around. Directly under the cockpit sole is the navigator’s area with barely space to sit up. “The only requirement that navigator Stan Honey had was that we made the navigator’s seat 1.8 metres long so that he didn’t have to fight the crew for a berth,” Read says. Another advanced feature not often seen on smaller craft is that the jib tracks run transversely instead of fore and aft. “The clews for each headsail are in the same place and we might use the same sail for going hard to windward and when easing off onto a reach. With this arrangement all we need do is ease the track car to leeward when coming onto a reach. This enables us to keep power on without altering the shape of the sail when changing course relative to the wind,” Read notes. The deck-stepped carbon fibre mast has swept spreaders to eliminate the need for adjustable running backstays. In some ways this is a disadvantage in that the masthead cannot be moved fore and aft when sailing up and downwind, but it eliminates the need for checkstays and runners. The masthead position is controlled with backstays to each corner of the transom and lines that are led into the mast from the backstays to control the rig bend. “I started this boat thinking I could race it,” says Jim Clark wistfully. A degenerative condition in his ankles that makes standing uncomfortable has recently cropped up in his wrists as well. 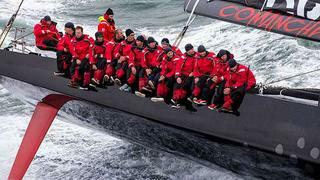 “They made a seat for me where I can drive it,” he says, but he opted out of the Sydney Hobart to make room for America’s Cup-winning skipper Jimmy Spithill to assist Read on the helm.